Now I know what you are thinking to yourself, I have hundreds if not thousands of policies at my organization – how can I possibly look at all of these costs for every policy? What a nightmare! Instead we suggest taking a random sample of your data set, as testing a subset of policies can save significant time. A good rule of thumb when taking a sample size is to use n=30, as a sample size of 30 policies or procedures will reflect enough of a sample to provide reliable results, without overburdening the person analyzing the data. A sample size of 30 is by no means required, but helpful in looking at costs spread across the organization. Often though, looking at 1-5 policies may give a good understanding of the costs associated to your policies. This will help you to see the multiples and inefficiencies within the policy lifecycle that can later be streamlined. Once you have decided on the sample size, or how many policies you will be calculating cost for, take a random (as best you can) sample of policies your organization may have. Make sure to include policies that may serve multiple departments, in case you have multiples of each policy. It is best practice to account these multiples, as multiples do have additional costs associated in maintenance and upkeep. Once you have decided on which policies to sample, it is now time to calculate the costs associated. Earlier we had a discussion that posed the question, “How much are each policy and procedure costing my organization?” In business, we often examine operational costs with heightened scrutiny, but rarely look at the costs associated with passing the intangible rules that your constituents (employees) work under to meet regulatory and operational requirements. It is often straightforward to calculate tangible costs such as materials or employee resources, but slightly trickier when we get into intangible assets such as software or intellectual property. Lastly, but still important, are the costs associated with policy and procedure management. To calculate the total cost of a single policy or procedure within your organization, we must break down the workflow that is required for a single active policy. To expand further, first, the policy must be created, reviewed and approved by the managerial team. Next, we need to look at the costs to store and distribute the policy or procedure to the employee base. Third, we need to consider the costs associated with employee certification and acknowledgement. And Finally we need to think about the costs to revisit and renew the policy. 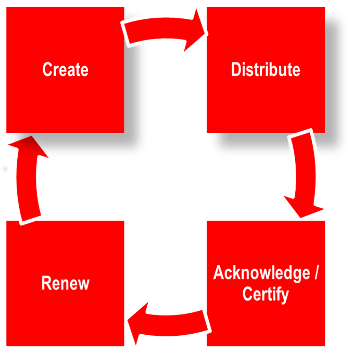 This workflow can be summarized as the Policy and Procedure Management Lifecycle. Every organization’s considerations when evaluating the costs of specific policies will be different, but what is important is to quantify the amounts for each part of the workflow. This will help break up the policy cost by specific item in the chain, allowing for a pinpointed cost structure. One of the most significant challenges compliance teams face, is the scattered policies around the organization in different shared drives. This often leaves redundant policies that may not even match between departments. By creating a centralized area for policies and procedures, automating the process, and streamlining the acknowledgement — organizations can achieve efficient policy management. So I challenge you: How much are your policies costing you? Would streamlining and centralizing the process through a compliance software save in the end? 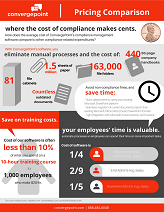 If you’re still not sure, take a look at our infographic, comparing the cost of compliance software to other compliance-related expenditures.